If you’re looking for a quality robot vacuum that will work well and isn’t exorbitantly expensive (relatively speaking, of course), this is your best bet. The iRobot Roomba 690 Vacuuming Robot is a cleaning powerhouse that offers a near-unparalleled amount of functionality. Well-adept at navigating around clutter and under furniture, the Roomba 690 is expressly engineered to suction everything from tiny particles of dust to large debris from virtually any surface—it automatically adjusts to all floor types, including carpet, tile, laminate, and hardwood. Conveniently, you can clean and schedule your robot vacuum anytime using the iRobot HOME app; both Amazon Alexa and Google Assistant are both compatible with the Roomba 690. One of the Roomba’s premier functions is its dual multi-surface brush system, which efficiently loosens dirt and removes it. 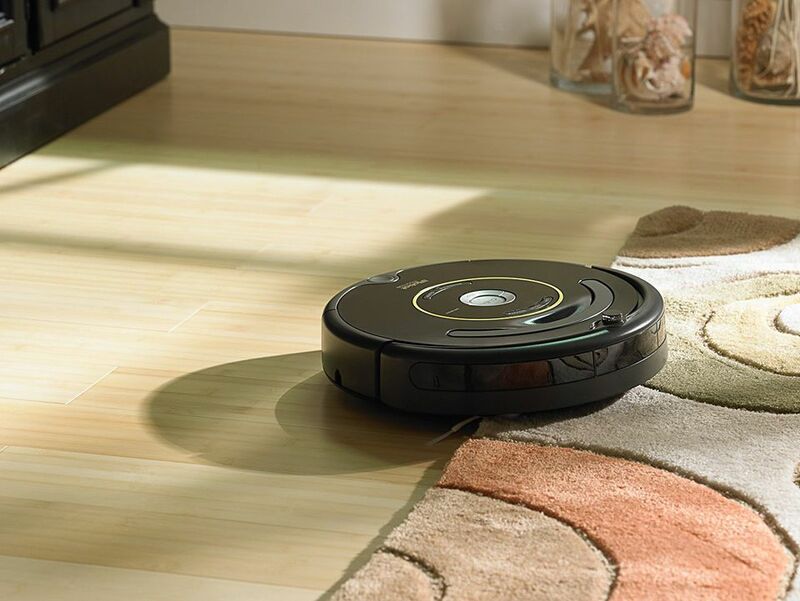 Specialized Dirt Detect sensors hone in on concentrated areas of dirt, while the Edge-Sweeping Brush allows the Roomba to sweep dirt and debris away from corners and edges. Banish pet fur, food particles, hair, dust, and other debris in mere minutes with the powerful iRobot Roomba 690. A robotic vacuum can be great for pet owners, especially where there’s an endless amount of hair or other messes accumulating on your floor every day, but some can be underpowered for the tough job. Not the case with this one from Eufy, which was made specifically for homes with pets. It’s got a three-point cleaning system which includes side brushes, a rolling brush and powerful suction that’ll give your floors a good sweep. It also has a powerful battery that will give you over one and a half hours of fade-free power and suction. Some of the features include an anti-scratch cover, infrared-sensor for detecting obstacles in its path and drop-sensing tech to avoid falls. It also recharges automatically so you never have to worry about that. Customers say it picks up tons of hair from the floor every day so it definitely gets the job done. Another thing they love about it is how quiet it is. One reviewer said they had two chihuahuas who usually bark at everything, but the vacuum is so quiet that they never bark around it. While our top choice is a total crowd pleaser, there are many owners out there who love their ECOVACS DEEBOT just as much. The biggest difference with this choice is that it can be controlled via app, so you can start—or schedule—your cleaning from the comfort of your mobile phone. It also comes with special sensors that help navigate it around nooks and crannies, which is an added featured from the Roomba. The ECOVACS DEEBOT it equipped with a speciality brush that allows it to achieve more lifting and deeper cleaning, particularly when it comes to carpets. It has a brushless motor that provides awesome suction power compared to other models. So you can bet dirt doesn’t stand a chance on your floors after this product makes its way through. Buyers of the product have been very pleased with this device since its recent debut. They do note that the affordability and navigation are the primary drivers behind their purchase decision, which gives it a leg-up compared to similar models out there. Their only complaints? It can sometimes get stuck on long fringe carpets, and can be difficult to connect to a network. This aside, the pros outweigh the cons on this customer favorite. Going with a robot vacuum is a huge time-saver, but it can be a pricey one. Finding an option that has both quality and performance is ideal, and this vacuum comes with both. Priced at under $200, the ILIFE A3 is notable for cleaning both on hard floors and low-pile rugs. It specializes in grabbing pet hair, but can be used for everyday dust and debris as well. It has a low profile so it can fit under beds and couches where dirt lingers and where you often forget to clean. The Amazon Choice has glowing reviews, with many saying scheduling it is easy and they love how it docks itself to charge after a day of heavy cleaning. Most say this excels and picking up pet hair and crumbs but isn't so great with kid messes like big cracker pieces or Cheerios. If you have extra cash lying around, this futuristic model is a great cleaning splurge. Boasting an array of powerful sensors and an advanced navigation system, the SHARK ION Robot Vacuum S86 is one of the best tools available for getting rid of pesky pet hair, picking up dirt and crumbs, and preventing any messes from piling up. This brand-new, recently released robotic vacuum has a powerful robot and a lightweight, built-in hand vacuum so that you can clean up different types of debris and spot-clean if needed. This popular vacuum is also enabled with WiFi, which means you can easily control it with the SHARK ION app and voice controls like Alexa. In addition, the powerhouse SHARK ION S86 is equipped with an XL dustbin and Smart Sensor Navigation 2.0, which helps the vacuum successfully skirt around any objects in its path, to successfully get the job done. Most customers say it’s worth the extra price because of its best-in-class build. Online reviewers also add that it maneuvers well around furniture and it's easy to use, making it a wonderful addition to their homes. Having a reliable robotic vacuum is everything. Therefore, when it comes to one that gets the job done—without a lot of charging—The Eufy RoboVac 11 is a smart pick. With up to 2.5 hours of cleaning time you can rest easy knowing your floors are going to be cleaned, STAT. Other attributes of this time-saving pick include a quiet operation and a 3-Point Cleaning System. This in particular works to ensure strong suction while it moves about the room. Additionally, it has anti-scratch glass and strong sensors that help it maintain an effective and safe operation while it cleans. With a 12 month warranty included, customers love the ability to try it without risk. While some say the vacuum has been known to get stuck on furniture, most are generally happy with how it performs, given its long battery life. If you have a lot of carpet in your house, this is the selection you should go with. The POWERbot vacuum is packed with technology that has 10x more suction power than the leading robot vacuum, to give you the best results around. It also contains a strong system that works to separate debris away from the chamber to prevent clogging—which is a great value add among robo-vacs. Plus, it works across all types of surfaces from carpet to floors with ease. This remote-controlled pick also has a built-in camera with nine sensors that help it navigate around your home. However, one thing reviewers note is that this device can sometimes repeat its cleaning path, so be sure to monitor it accordingly. Although it's most effective on carpet, users still consider this a standout pick across several surfaces.